Pentre Ifan -" the homestead of ifan". One of the most spectacular Ancient Monuments of Wales. The Remains of one of Finest Neolithic Burial Chambers in Britain. 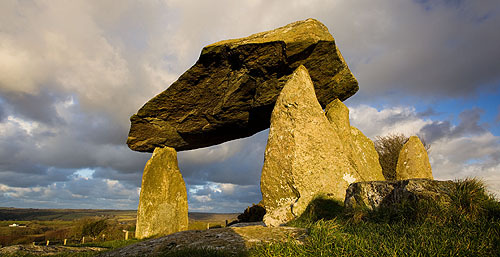 A Neolithic ( 3500BC ) - Portal Dolmen ( Cromlech in Welsh ). A Chambered Tomb , with a 16 ton , 16ft Capstone , balanced on 3 pointed , slender uprights / Forming a chamber where the remains of the dead , of an important family , could rest . Dry stone walls would have completed the inner structure , the whole covered with stones . Final structure 36m - ( 120ft ) long.